[UPDATE] Please note that SharePoint 2010 does not support Kernel Mode Authentication, and disables this by default when Web Applications are created. Please see this post for more details. 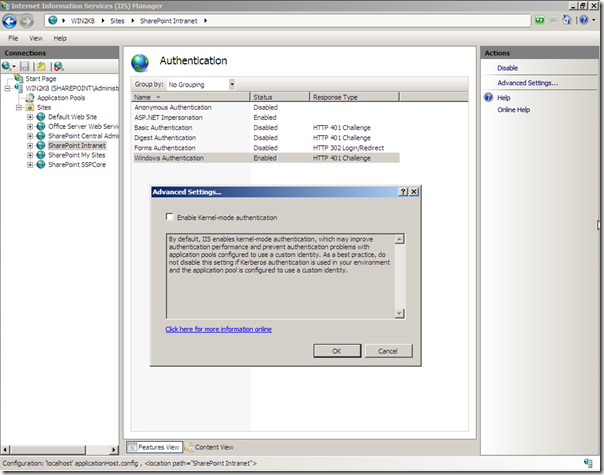 As I demonstrated during the Kerberos session at the Manchester SUGUK meeting last month, there is an extra step required to enable Kerberos Authentication for SharePoint when using Windows Server 2008. 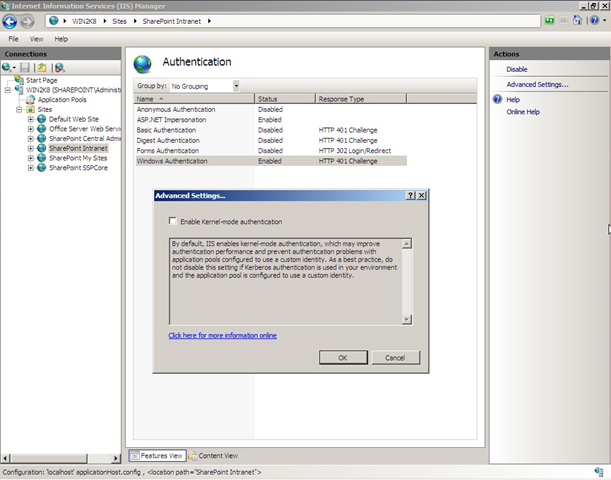 One of the security changes in IIS 7.0 is that Windows Authentication is performed by default in the kernel. This is a good thing! It eases the configuration required for Kerberos and improves performance significantly. Because HTTP.sys is handling the authentication, it is by default done under the LocalSystem account regardless of the application pool identity. This means that the creation of an SPN is unnecessary because default SPNs are created when the server is joined to the domain. You can of course change the app pool identity without having to register a SPN, and the app pool account doesn't need to be a domain account. All in all this is a *great* feature! However, it trips up SharePoint as even on a single server SharePoint is currently considered a web farm (should use a domain account). Therefore you need to use the application pool identity for authentication. I recommend doing this on a Web Application basis (obvioulsy!) There is no ability to edit this value using the IIS Manager. Don't ask me why, I cannae tell ya! More in depth articles on Kerberos coming soon. First up will be the how to measure authentication performance paper.